It may have become this generation’s Friends Reunited - the social network that burned brightly before burning out - but at its height, MySpace was one of the biggest websites in the world. It was also the platform that, if you believe the media narrative, helped launch the careers of everyone from Arctic Monkeys to Lily Allen. Now, out of the blue, it’s back in the news once again… but not in a good way. In case you weren’t aware, MySpace is still running, but a statement that pops up on its website reads: “As a result of a server migration project, any photos, videos, and audio files you uploaded more than three years ago may no longer be available on or from MySpace." Yep, you read that right: the site that was once famous for being the social media starting point for up-and-coming artists has apparently lost a massive amount of their content. So, if you didn’t back up your school band’s tunes or the beats you made in FruityLoops, there’s a pretty good chance that they’re gone forever. Despite the implication that was a ‘sorry, we messed up’ moment, there are those who aren’t convinced. Technologist and blogger Andy Baio, a former CTO of Kickstarter, Tweeted: “I'm deeply skeptical this was an accident. Flagrant incompetence may be bad PR, but it still sounds better than ‘we can't be bothered with the effort and cost of migrating and hosting 50 million old MP3s’”. 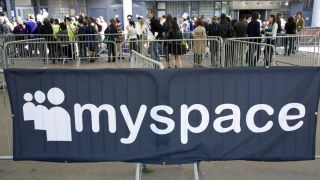 Launched in 2003, by 2006 MySpace had become more visible than Google in the US, but was surpassed by Facebook as the world’s biggest social network in 2008. Despite a music-led, Justin Timberlake-endorsed relaunch in 2012, it’s never recovered the ground that it lost. Of course, whatever the truth, there could actually be an upside to all of this. You might have been worrying that, if you ever did get famous, all of those embarrassing early demos and dodgy promo photos would have come back to haunt you, but that potential problem just went away.